Scranton, IA - A leading manufacturer of refuse trucks, Scranton Manufacturing, announces it has increased the certification requirements for employees who assemble New Way® garbage trucks. The company has taken employee certifications to a higher level for many aspects of the manufacturing process including electrical, programming, welding, and painting. The efforts are all part of New Way’s pledge to continue “driving the difference” by creating a new standard in refuse truck quality. Scranton teamed up with Iowa Central Community College to implement the programs, which aim to further increase the product quality and reliability. Going above and beyond the industry standards, workers must also meet Scranton's specific in-house requirements for quality. 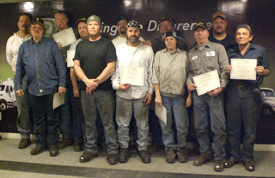 New Way's entire welding department is now working at a much higher skill level. All New Way® welders are certified by the AWS (American Welding Society). David Trecker, who oversees the welding department, said, “We are able to ensure the best training for our welders. They are able to complete the highest-quality work, but also stay very efficient, which is good for us in the factory.” Mounting technicians, who implement the electrical interfacing and programming between chassis and New Way® bodies, are certified on the latest integration software for both International and Mack Trucks. The paint department has undergone master level training from Exalta to increase paint quality and appearance on all New Way® Trucks. "We strive to make New Way® the highest-quality truck on the market. By implementing continuing education for employees, we can keep 'driving the difference' for our New Way® customers," said Michael McLaughlin, Scranton Manufacturing’s President. The company was founded in 1971. Its New Way® products offer a full line of affordable refuse equipment. New Way® has become a leader in the waste management industry. They have expanded to sell units internationally and have two Joint Ventures in China.